for working professionals in Brighton & Hove. The shared living market is changing and the old days of sub standard accommodation is no longer acceptable to working professionals. We are on mission to change the way people live together and pioneer a revolution in urban living. Our design-led approach provides unique customer-centric spaces for people to live, work and play. The Co-Living Spaces experience combines; community, inspired social spaces, smart technology, enhanced facilities and snug bedrooms. Our developments are highly bespoke, thoughtfully designed and centrally located. Join our community and experience the next generation of shared living. Thoughtfully designed and highly bespoke micro co-living in central Hove for working professionals. Urban Co-Living located in the heart of Eastbourne with inspiring social spaces and thoughtfully designed rooms. 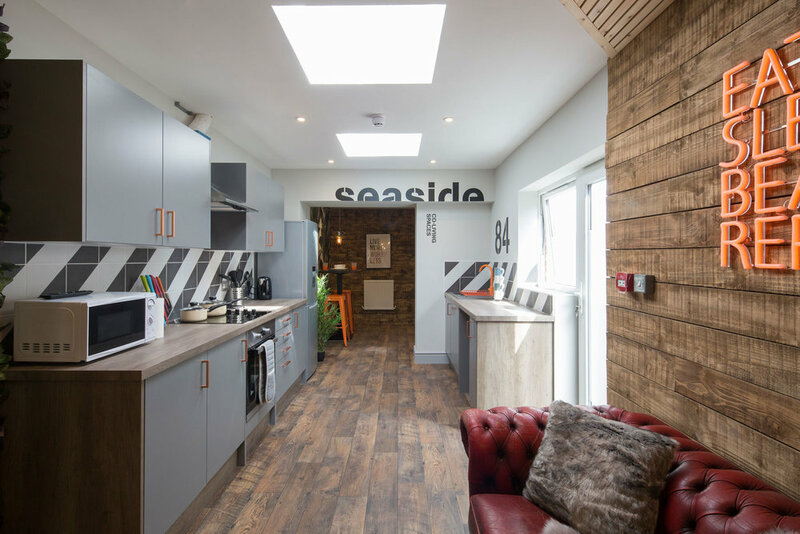 Luxury Co-Living located in the heart of Brighton & Hove for the professional, digital and creative sector. We recently won two national property awards for our innovation in the property industry. Our director Stuart Scott won the highly prestigious UK 'Property Investor of the Year'. Co-living Spaces also won 'HMO deal of the year' for our work to pioneer change in the HMO market. Next year we will continue our mission to champion the next generation of urban shared living. Inspiring social spaces designed for eating, socialising and laptop lifestyle. Thoughtfully designed bespoke interiors with stunning lighting displays and custom made industrial furniture. Fully equipped cafe kitchens provide great spaces to eat meals, create new dishes and socialise together. Open-plan living with a selection of bespoke seating and industrial mood lighting. Experience a great nights sleep with a memory foam mattress, LED mood lighting and blackout blinds. Carefully designed micro-living with every centimetre considered. Bespoke beds, USB phone charging and plenty of storage. To re-imagine shared-living for working professionals. To pioneer the next generation of modern Co-Living. To change the bad reputation of the HMO industry. 8+ years of successful delivery across a range of projects from single-lets and commercial spaces to HMO’s (houses of multiple occupancy). We offer you excellent fixed returns on your capital which we pay to you monthly, annually or as a lump sum at the end of a development project. Our Director has designed customer experiences for some of the biggest global brands and has 20+ years award winning design experience. Contact us today to see how we can help you achieve better returns through property investment. We have been featured in Esquire Magazine as part of an article on the UK Property Investment Renaissance. It shows how becoming a disruptor and re-defining micro living can be a positive thing in a changing market. Our director Stuart Scott was interviewed by Mike Stenhouse on the renowned Inside Property Investing podcast series. This podcast features some of the most inspiring and successful property investors in the UK. Our director Stuart Scott has been traveling around the UK speaking at leading property events. He shares with audiences how we use design and innovation to create some of the best Co-Living on the market. Co-Living Spaces was created as an ethical investment company to push innovation within the multi-let / HMO market as the sector transitions to flexible co-living and co-working spaces. Find out about how our design and innovation led approach has allowed us to create unique spaces that achieve market leading rental and maximum resale value.